Last week Zen Mustache played back-to-back shows on Saturday night at the Laughing Goat in Boulder, and again on Sunday afternoon at the South Platte RiverFest in Denver. Both dynamic, energizing and fun shows! Some stark differences, too. I’ve written before about the tight stage at the Laughing Goat. The venue’s small space and eclectic adornments, along with close proximity to the audience, inject energy into the performance. To fit the entire band on stage I can’t bring my usual keyboard rig and instead play the house acoustic piano. Fortunately it is always in tune. The odd thing in the Goat is the piano faces the wall, away from the band and away from the audience. Consequently, for me this show became a highly audio experience; rather than making eye contact with band mates I needed to listen closely to the others and feel the changes in the music. It’s a different experience altogether and one I appreciated. I also love playing acoustic – feel I can play harder and faster and my confidence is higher moving fingers over real ivory. One other note. It’s satisfying to introduce new material and on this night we performed ‘In A Day’ for the first time. This is a vocal-focused song with 4-part harmony supported by simple piano and guitar lines. 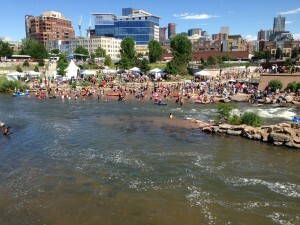 If Saturday night was cool, Sunday afternoon turned hot at Confluence Park in Denver! The RiverFest was a great way to cool things down. The festival was well-organized and the friendly staff were so helpful making us feel comfortable and welcome. What a terrific event! In contrast with the previous night, my takeaway from this show was all the visual scenery. 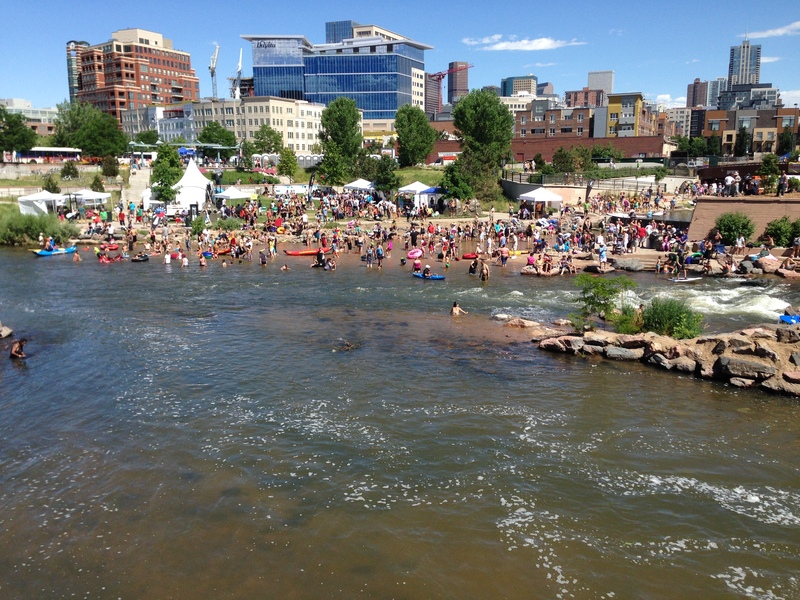 Keyboards were positioned stage left which provided a vantage point to view not just the people who pitched blankets in the grassy area in front of the stage, but also all the kayaks, tubes, paddle boards, and people generally enjoying the river. Ted came over to this side of the stage to play bass on ‘September’ and gawked at the fantastic view from this side of the stage. My favorite was looking across the river at the people on the opposite side. After our set I crossed the water to check it out and those spectators had a wonderful view of everything – the stage, the water, the vendors and people. If Ted was gawking from the stage, he should have made his way over there – that was the place for onlookers to truly gawk! It’s good to see the movement toward more originals. For this set the original:cover ratio was 1:1. In past shows this has been as high as 1:4! The process of writing and introducing new original music continues, and we look forward to the goal of an entire original show! Final note: The sun and heat was intense on Sunday. In fact my Korg keyboard, positioned at the front of the stage, was not protected by shade and the LED screen on this keyboard got fried during the performance! Hoping it’ll come back but luckily that day was the final performance for the Korg – switching to the new Hammond XK-3 this summer and repurposing the Korg for home recording. Whew!